Again this spring we have bluebirds nesting in our newspaper box. Our mailbox is a brick thing standing by the side of the road near our driveway that has a standard-issue USPS mailbox embedded in it. And below that is a piece of white PVC pipe embedded in the brick which is used by the newspaper delivery guy. We got a bit worried about the bluebirds because they would fly out every time anyone came near to the mailbox. And the newspaper guy would just stuff the paper in there, so I think they must have been inconvenienced to say the least. We did eventually see three little hatchlings. One we later found expired at the foot of the mailbox. 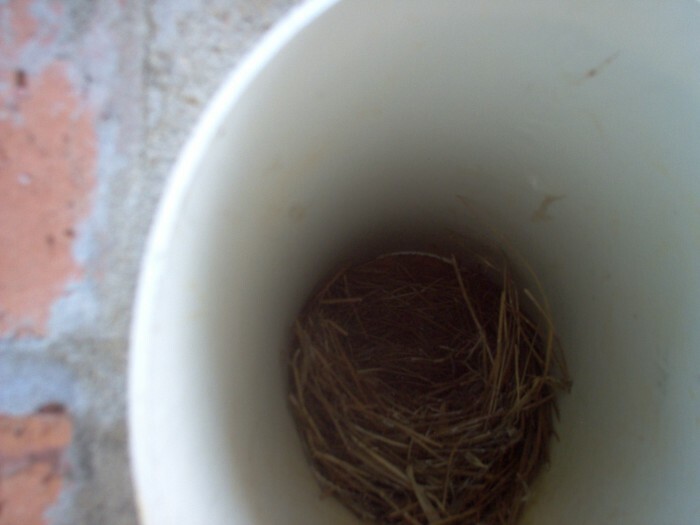 I went out to take a picture of the others, and the nest is empty! Didn’t see the little guys at the base of the mailbox. Maybe they were mature enough to fly away? The adults bluebirds are still fluttering around on the other side of our narrow road. So maybe the little ones are in the grass or in a nearby bush.